When it comes to professional-grade power tools, DeWalt is one of the best names in the business. Due to their durability, reliability, and efficiency, we’re always glad to have one of their tools on a review. That’s precisely why we were very excited to give DCD985B an in-depth look – is this yet another great drill from DeWalt? Featuring things like a ratcheting chuck, three-speed transmission, 500 in-lbs of torque and fantastic ergonomics, it’s no wonder that this model is a favorite of many handymen. It’s a powerful machine that’s suitable for all drilling, hammering, and fastening applications, and as such deserves a detailed review. To find if it’s worth the price, we got one for ourselves and carefully analyzed its comfort, ease of use, overall design, power, durability, and the rest of the features. If you’re searching for a reasonably priced but still a highly-efficient hammer drill, read on! The DeWalt DCD985B is more than capable of handling all hammering and drilling applications that you can think of. The thing that makes this possible is the unit’s powerful motor, which can be used at three different speeds and powers the high-quality 1/2″ metal ratcheting chuck. The model is well-balanced and provides the user with ergonomic shape – the fatigue is kept to a minimum and there’s little to no kick back. Other features include an integrated LED light, a very convenient 360° side handle, as well as 22 adjustable torque settings. The unit is powered by a 20-Volt MAX Lithium-Ion battery (which is sold separately, just like the charger) and comes with a very generous warranty package. It’s time to check out the features – read on! Black and yellow, just like all other DeWalt power tools, the DCD985B features an ergonomic shape and is very well balanced. It is one of the most lightweight units of this type on the market, at only 3.9 pounds. 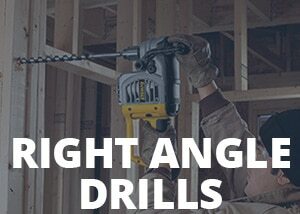 This is guaranteed to be of great help during extended drilling operations, primarily when working overhead. The addition of a side handle is a significant advantage. Attaching it to the unit is unusually smooth and it can be positioned anywhere on the device (it is 360-degree rotatable). It provides extra control during the hammering and drilling and is something that deserves special praise. The overall build quality is, in our opinion, fantastic – the device feels exceptionally sturdy, and we’re pretty sure that it can easily withstand any kind of mechanical damage. It’s something we’re used to when it comes to DeWalt tools, and we hope to see this kind of quality construction on all of their future power tools. The machine is powered by the high-efficiency 535 UWO (Units Watt Out) engine, which provides superior performance no matter what task you throw at it. It makes this drill a good workhorse, allowing it to reach the maximum torque of 500 in-lbs and the maximum speed of 2,000 RPM. The motor can be used at three different rates – 600, 1,250, and 2,000 RPM, allowing the user to adjust the speed to the task at hand. The DCD985B has an all-metal ratcheting chuck (1/2″), with its jaws having a carbide coating. This leads to an exceptionally strong grip, particularly if we’re talking about round shank bits. Using other drill accessories is not an issue here – you’ll be able to use your wire brushes and sanding pads as well. Unfortunately, the 20-Volt MAX Lithium-Ion batteries for this unit are sold separately. Nevertheless, they provide the drill with a right amount of juice and allow continued operation. We recommend purchasing the DeWalt’s DCB115 charger, too – it’s among the fastest ones on the market. There’s a lot to like about DeWalt DCD985B – it is among the best cordless hammer drills that money can buy today. It impressed us right from the start with its ergonomic shape, durable housing, and a rotatable side handle – these three things are guaranteed to be of great help while you’re working in harsh conditions. We were also quite pleased with the unit’s performance. Testing it in wood, metal, and concrete showed excellent results, which is precisely what we expected from a device manufactured by such a reputable company. The unit’s chuck deserves some special praise – it has a good grip and allows usage of countless drill accessories. Our only major complaint about this drill is that it overheated a couple of times during the testing. It was nothing serious, but it was definitely noticeable and sure to cause concern to some users. We advise taking frequent breaks while working with DCD985B – you’ll give your machine a longer lifespan. Even though we’ve encountered no such issues, one of our readers reported wobbliness of the chuck. A vast majority of the users didn’t mention this problem, so it’s probably a one-off problem caused by a defective unit. The user experiences with this cordless hammer drill are mostly positive – people are calling this device a “beast” and something they’re using on a daily basis. They’re praising the convenient side handle, the 3-speed transmission, the high-quality chuck, and a myriad of other features of DCD985B. Some users are particularly happy with the provided warranty, stating that a 3-year warranty is a rarity these days and that it gives them confidence about the drill’s durability. Cordless drills manufactured by DeWalt have always been good performers, and we can safely say that DCD985B has lived up to our expectations. This is a premium tool in every sense of that word, as it features high-quality construction and efficiency that allows working with all sorts of sturdy materials. The reasonable price and the generous warranty are just bonuses and something that makes the whole deal even better. The competition will have a tough time!